Maybe Ellen DeGeneres should stick to water at her next dinner party. The talk-show host and comedian told her audience Tuesday that she was hospitalized with a dislocated finger after a wine-related mishap. DeGeneres said that she and her spouse Portia de Rossi were returning from a dinner party and “almost at the front door” when the mishap occurred. “The dogs were so excited to see us and I just caught the lip of the top step. I was like a foot away from the door and I fell into the door and it did something to my finger, cause I knew something was wrong,” the talk-show host said. “Okay, so, my first thought was no big deal Obama Care will cover this. 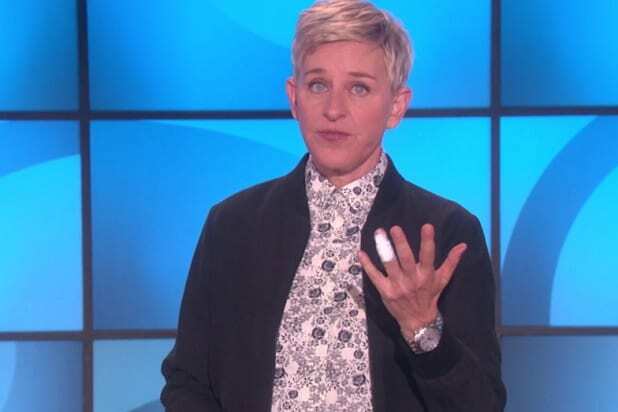 So, Portia drove me to the hospital, to the emergency room,” DeGeneres continued, before showing the audience an image of the resulting x-ray of her finger. Watch DeGeneres detail her alcohol-fueled injury in the video.